A little over a year ago I hosted an adoptathon for rabbits, as a way of sharing information about rabbit care and the choice to take a rabbit as a pet. Easter is a popular time for families to choose a rabbit as a first family pet. When this choice is made as an educated one, it can mean a great experience for both kids and the rabbit. 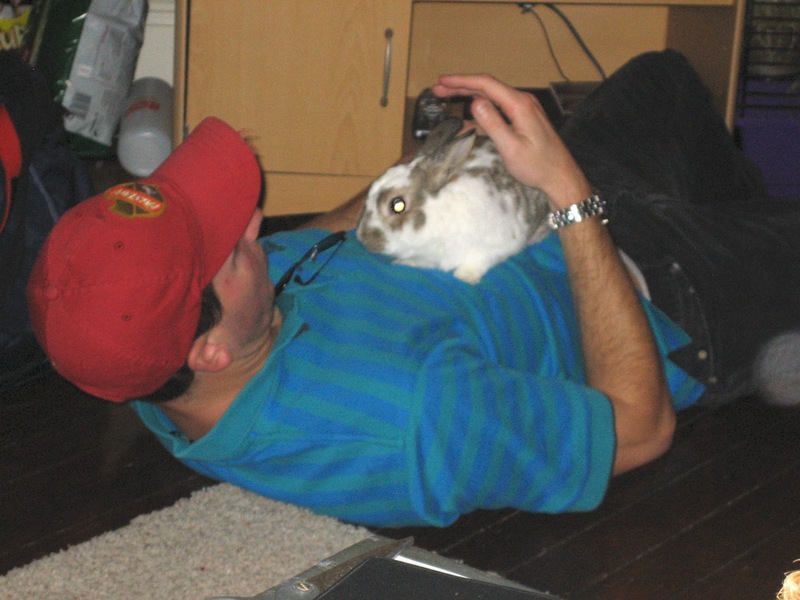 Older children do best with rabbits, who often need a quieter household and prefer very little handling. Sudden noises and too much excitement will often drive a rabbit to withdraw into his kennel, spending little time exploring his home and getting exercise. You can probably see why a home filled with youngsters is possibly not the right environment for many rabbits. 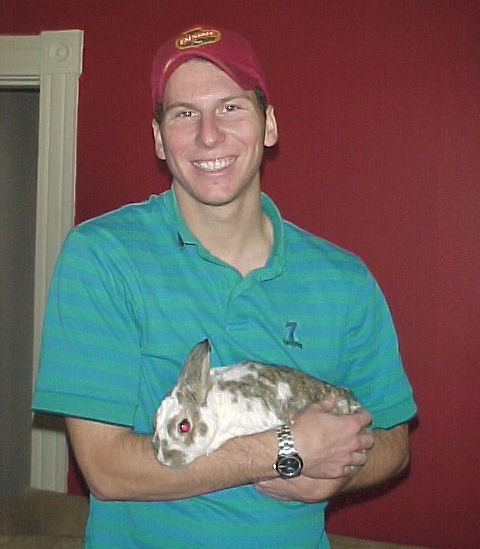 By asking others to share adoptable rabbits, I hoped to encourage adoption while working to educate would-be rabbit owners about what they are getting themselves into, before making a choice they end up regretting. Rabbits are wonderful pets for the right owners and the right homes. Just as other pets, they need a certain environment, care and attention to a healthy diet. As is often the case with dogs, we assume that what we remember from our childhoods is what is best. Unfortunately rabbits cannot live on carrots alone. If they did, they would be extremely unhealthy. Yes, they love carrots. However, carrots are high in sugar, and should be fed sparingly; a tiny baby carrot once or twice a week is plenty. Too many rabbits are overfed their store bought rabbit food, which is often high in carbohydrates. Rabbits need a steady diet of fresh green vegetables, and veterinarians often encourage us not to offer much iceberg lettuce. They prefer Romaine and other lettuces that are higher in nutritional value. While fruit can be a welcome treat, it should be treated as such and given in tiny quantities. Just as you would give your toddler one cookie and not 3, offer your rabbit only a slice of banana, rather than 1/2 of the banana you may be preparing to place over your cereal. Most importantly, rabbits require a great deal of hay as fiber and a digestive aid. Most veterinarians prefer Timothy Hay for the average rabbit, but be sure to look into what is best for the type of rabbit you may choose. Bedding options are available, and some may be less healthy than others. Ask your vet for advice on the choices available to you and what is best for your bunny housemate. Sadly, our rabbit, Robby, passed away on Easter Sunday last year, shortly after the adoptathon event. I have asked two blogger friends who are more involved with the rabbit scene than I to take this event over. AfFURmation and Bunny's Blog have agreed to run the adoptathon and I would like to encourage you to help them highlight adoptable rabbits from Petfinder.com, as we strive to find homes for these homeless bunnies, while educating the public about their care. Be sure to say thank you to this event's new hosts. I am grateful to see Robby's memory go on in this adoption event. The 2nd Annual Rabbit Adoptathon Blog Hop will begin at 6 PM ET May 13 and run through 6 PM Saturday, May 19. I'll be at my son's engagement party as the hop wraps up, so I'm leaving you all with the responsibility to give it a good send off. Thanks and lots of nose wiggles to all those cute bunnies! WE TRY NOT TO DISCRIMINATE.. ALL PETS NEED SAVING!!!! THANK YOU!!! Thanks for sharing Carrie! Shelters and rescues will start to see more rabbits surrendered so the more help we can give them the better. I'll go check it out. I've had rabbits and they can be very sweet. I also ADORE guinea pigs! Thanks for founding the Rabbit Adoptathon Blog Hop. Without your concept, we would not have what I hope will become an annual event. I am so sorry to hear you lost Robby last year, but our fur babies live with us forever in our hearts!